Always leave enough time in your life to do something that makes you happy, satisfied, or even joyous. That has more of an effect on economic well-being than any other single factor. Every summer as I’m delighting in the lavish bounty of my garden I promise myself that this time, for sure, I will plant a winter garden and keep the fresh veggies coming. And at some point every January or February I realize that once again the winter garden hasn’t materialized and it’s time to start preparing the plot for spring planting. This October as I was on the return lap of my road trip I swore that the first thing I was going to do when I got home was to put in that winter garden. No excuses this time. And then I got home, and the truth hit me. The reason why my best intentions come to naught every fall. It’s because in November, when the summer garden is fading out and the time has come to till the soil and plant winter crops, one has to make a choice: put in that winter garden…or make one’s house shiny clean and nice for the holidays. I love the holidays. The holidays merit a shiny clean house. I also have two young children, and that house ain’t going to scrub itself. So I got to cleaning. But I couldn’t bring myself to let go of the winter garden idea. I realized that what I need is a set of raised beds near the house, dedicated solely to stuff like lettuce and broccoli and cabbage and stuff that will grow year-round here. Not having time to build these raised beds at the moment (see holidays and housecleaning, above), I opted for a quick fix. 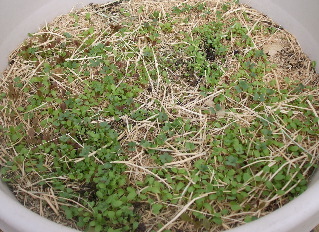 I picked up the biggest plastic pot I could find at Home Depot (24″ diameter), set it up out of reach of the dogs (on a couple of old truck tires; effective if not terribly pretty), filled it full of organic potting soil and seeded it liberally with radishes, broccoli, carrots and several varieties of lettuce. I just mixed everything together; there’s no “radish section” or “lettuce section.” I figure I can eat all the thinnings and end up with a handful of adult plants spread evenly around the pot. The carrots are experimental: I’m not sure if carrots will grow in the winter here and this seems like a good way to find out. Everything sprouted very quickly; I’ll need to do a lot of thinning. I want to take a moment to sing the praises of Hybrid Packman broccoli. This variety not only has a mild, delicious flavor, it also has the wonderful habit of growing nearly full-size heads to replace the ones you harvest — over and over, for as long as the plant lasts. I have broccoli in my garden right now that I planted last spring, that are still producing beautiful heads! So even if I only have room for one adult broccoli plant in my little winter garden this year, it should still produce a satisfactory amount of edible goodness. As for the lettuce, once it’s big enough I like to harvest it by the leaf rather than by the head, so one plant of each variety should provide many salads. The only variety I’ve had any luck with in my summer garden is Romaine, but for the cooler weather I’m trying a few different kinds to see how they do. I also like Cherry Belle radishes and Tendersweet carrots. I didn’t plant cabbage this fall because of space constraints, but as my winter garden setup grows I’ll be adding both green and red varieties. I’m pretty excited about the prospect of year-round fresh-picked goodies, but experience tells me that these things rarely work out exactly as planned. I’m eager to see what thrives and what doesn’t in my little miniature garden. Yeah – I was right. It IS New Zealand (or Malabar) spinach. It’s a ‘summer spinach’ and it’s a vining plant that produces for several weeks so it should work well for you – just like the Packman. I think you’ll like the taste a lot – it’s wonderful in salads. BTW, you should get a copy of that ‘square foot gardening’ book I sent Dani if you really want a good winter garden box. We did ours up on sawhorses. You just put a good quality plywood bottom on the box and drill some holes for drainage. Sure, the water will eventually rot the plywood but that will take a few years to do since you’re just pouring a cup of water per square per week into the box. My old standby Gurney’s doesn’t offer the Malabar spinach, but it looks like I can get some seeds at my other old standby, Amazon. I’ll definitely check that out in the spring, it looks great! About the raised beds…I have a phobia about using plywood in food gardens. I don’t know how valid my fear is, but I’m afraid that the adhesive chemicals used to make the plywood will leach into the soil as the wood decomposes, and contaminate my veggies. My long-term plan is to build a long, deep, narrow bed out of concrete blocks or landscaping stone, about four feet high, all along the southern side of the house. Decorative, functional, and relatively critter-proof, plus it’ll be just the right height for comfortable maintenance. That’s probably a year or two down the road, though. take a peak at WiserEarth.org, a directory of nonprofits around the world started by Hawken! Great site, Michael! I love to see people coming together to really make a difference that way. Makes me feel just a little more optimistic about where things are headed. Try this website if you want something a bit more eco-friendly. http://www.squarefootgardening.com/ – they have garden boxes that they sell (though not during November for some reason) that can be used on the ground or raised. I’ve heard there are ways to keep chemicals from leeching into the dirt but offhand don’t recall what it is. I’ll check the book and see if I can find it though.